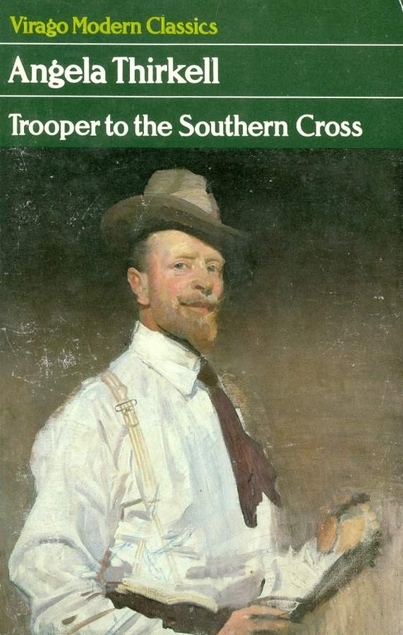 This entry was posted in Books and tagged Angela Thirkell, Australia, Trooper to the Southern Cross, Virago Modern Classics, World War 1 by Katrina. Bookmark the permalink. So did Thirkell live in Australia for a while after WWI? I guess I didn’t realize that. How good it is that she has made a novel out of what happened during that time. Thanks so much for the info, and my next remark is “How fascinating!” Mind, I have never read Thirkell, but I must, must try her. (I know, I’ve said this before!) I’m going to my list and putting her on it. Our libraries will definitely not have any of her works at this point, but I might scare one up online. No pressure, but do you have a recommendation of a good one to try? You might be surprised, I’m pretty sure that there are libraries in the US that have at least some of Thrikell’s books in their Reserve Stock. My favourites are those that were written in WW2. Mind you they aren’t for everyone, I think she often wrote long ‘rambles’ which might appear to be badly written but it was deliberate. Her books are full of literary allusions. Maybe you could try Before Lunch or Cheerfulness Breaks In – both published in 1940. Thanks, Katrina, I’ll do just that. This sounds like a fascinating book! I haven’t read anything by Angela Thirkell yet and I’m planning to start with her Barsetshire novels, but I would like to read this one as well at a later date. I think she’s a love her or hate her author, I think that the wartime books must have been a joy to the women who were battling with all the domestic problems they had such as trying to feed their families. She goes off on a rant against the powers that be now and again. Such fun! It seems like everyone is reading Thirkell this summer! Next on my list is Pomfret Towers but this does sound like an interesting departure from Barsetshire. I’m quite fascinated by Australians and I do love stories about long ocean voyages so I must look for this one. It’s well worth reading although the Barsetshire ones are my favourites. I’ve started to re-read them from the beginning in the correct order this time.